Want a little insight to the underground world of a street and graffiti artist… then read on. We’ve just completed a (what we think is!) fantastic big piece of new street art in Glasgow (pictured below) and wanted to celebrate the skills of the man responsible for bringing our concept to life and painting it, Rogue-One, with a short interview. Art Pistol (AP): Tell us a little about how the project has progressed. Rogue-One: First step was to stand back (wwway back, lol) and have a think about the size. This was the biggest mural I’ve done. After a bit of thought I decided that 3 tons of emulsion painted on to start with would help save in spray-paint and would also give me a good start. I painted the top third with light blue, the middle with light teal and the bottom third with teal, then faded the teals together. This straight away gave the appearance of what I was going for, the sky and water level. At the last minute I realised a small tub of green emulsion along the bottom ground edge would also save paint and help with the murky river bed. Next step was to mark up the outlines of each character and the city sky lines. After years of working on this scale with graffiti it wasn’t too hard, sometimes you start with a grid, sometimes you just go for it. The scary part was climbing the ladder, lol. Once the background colours and outlines are ready the fun part of painting begins. Almost a month of work was spent on painting, moving from panel to panel, top half and bottom half and finally finishing details. Hard work but fun. Click here for more photos and the full story. After you’ve heard a little more from Rogue-One that is! AP: What effect do you think it will have, or hope it to have on Glasgow? Rogue-One: Glasgow (like any city) needs colour, and people are enjoying seeing these large murals start to pop up around the city. I would like to think they are, lol. As one person said to me “it brightens the place up and gives you something to smile about on the way to work”. 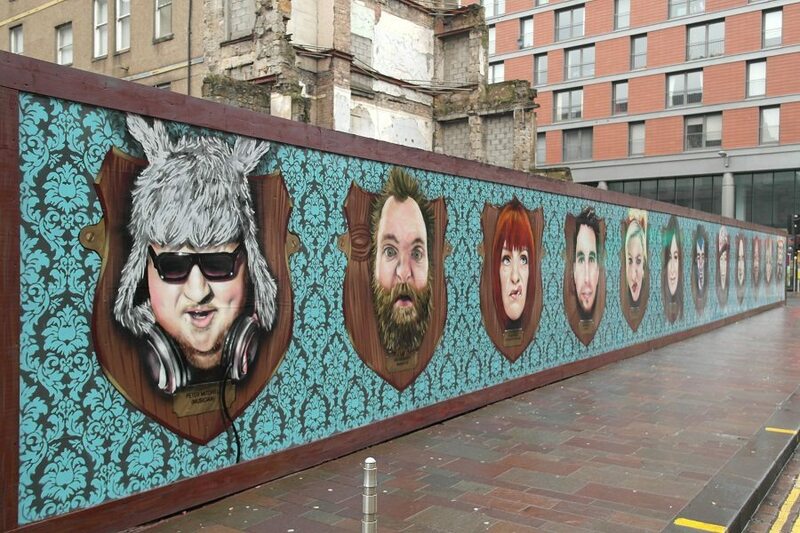 AP: What’s your favourite bit on the Clyde Street mural? Rogue-One: Being asked my favourite bit is a hard one. I enjoy what I paint, so the bit I’m working on is usually my favourite at the time, it has to be to do the best job I can. In the end standing back looking at the mural or looking at the photos, I always pick parts out and feel they would have been good together in one image. 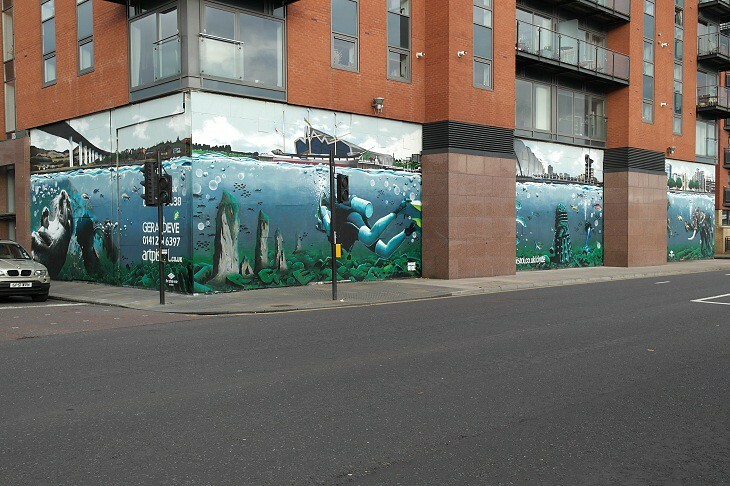 In the Clyde Street mural its maybe the otter, or maybe the diver, or maybe even the Dalek, I’m not giving anything away, lol. AP: How many years have you been doing this and what was your first work? Rogue-One: I’ve been spray painting for over 15 years now. I started like most graffiti artists do, the typical tagging on the streets. Then moving on to finding and painting at quiet spots in or out of the city where I have the time to freely paint more detailed work. My first mural or piece was a painting of hip hop rapper ‘ice cube’ on a wall down the street from where I lived as a youngster. I thought it was great, and when travelling on the bus by the wall I would overhear the people saying “look at that!” and pointing. This is what helped give me the thrill of graffiti and got me hooked. AP: Any mishaps on jobs, or ridiculous stories you can share, minus the incriminating stuff! Rogue-One: Not really, nothing comes to mind, or maybe I’m just not telling, lol. AP: Any thoughts on the future of street art in Glasgow and the UK? 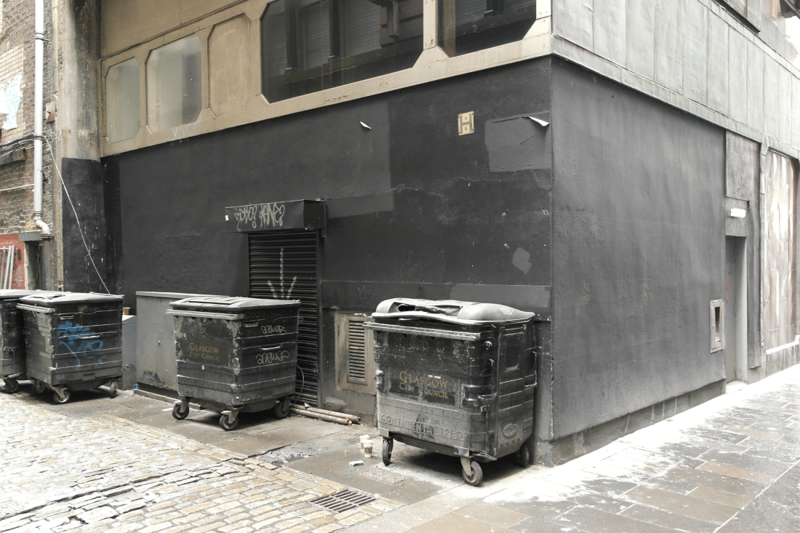 Rogue-One: I like seeing Glasgow start to appreciate spray-paint murals. It makes me feel like we might finally be becoming like other cities, Hamburg, Berlin, Paris and Barcelona. I think it’s great to see a city covered in art, don’t you? AP: How did you find working with Art Pistol on this project, as opposed to doing your own thing?